The sure-fire way to make learning and speaking thousands of new words as easy as finding a picture! 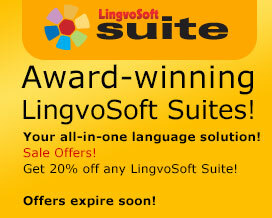 LingvoSoft Talking Picture Dictionary lets you choose from thousands of pictures and have the translation spoken aloud. No matter what your skill level or age you can now communicate accurately simply by pointing your finger. THE ONLY 39-CROSS-LANGUAGE PICTURE DICTIONARY FOR ANDROID! Cross language means that you can translate between any of the 39 languages with no limit: Albanian, Arabic, Armenian, Bosnian, Bulgarian, Chinese, Croatian, Czech, Danish, Dutch, English, Estonian, Farsi, Finnish, French, German, Greek, Hebrew, Hindi, Hungarian, Indonesian, Italian, Japanese, Korean, Latvian, Lithuanian, Norwegian, Polish, Portuguese, Romanian, Russian, Serbian, Slovak, Spanish, Swedish, Thai, Turkish, Ukrainian, and Vietnamese. You can translate words from Korean to Russian or even Vietnamese to Slovak instantly. Each word has a corresponding picture and FLUENT HUMAN PRONUNCIATION so you can memorize it easier and even have a pic to reference it to.